Tutor/Mentor Institute, LLC offers Investors, Sponsors and Business Partners Social Return on Investment. As a result of the work we do more youth in high poverty areas will be able to participate in mentor-rich non-school programs. Investors will enjoy the rewards of seeing their money do good; while also earning a reasonable rate of return from their investment. What other VALUE do we offer potential investors, sponsors, partners? By collecting, sorting, sharing information anyone can use to build strategies and support actions that help kids from poor neighborhoods expand their network of adult support and learning opportunities, we offer a “TIME SAVINGS” to millions of potential users who would have to spend a considerable amount of their own time searching for this information, or, understanding how to apply it. Value # – Lower Costs of NPOs acquiring dollars, volunteers, etc. Value # – Increase talent retention and human capital in NPO sector. By helping non profit tutoring and/or mentoring programs attract volunteers and donors at lower costs, we improve the consistency of funding, lower the emotional stress of fund-raising, and encourage more people to stay in jobs longer…..thus increasing the level of knowledge and experience within each organization and across the entire sector. By helping companies from many sectors develop employee engagement strategies within tutor/mentor programs we provide informal learning opportunities for volunteers who take on leadership and project management roles in NPOs. This article, titled Exploring the Role of Boundary Spanning in Distributed Networks of Knowledge, illustrates the value of informal networks connecting people within companies and at multiple locations. Connecting employees in a tutor/mentor program strategy can help build informal networks that benefit businesses. Engaging employees as "network builders and boundary spanners" gives them skills they can use to lead other communities of practice within a company. By encouraging volunteers from multiple sectors to participate in individual programs, we expand the informal network for every volunteer involved….as well as for every youth involved. By helping companies connect with tutor/mentor programs throughout a city like Chicago we help companies share their values, products and services and work opportunities with thousands of people who are potential customers and future employees. Without using T/MI Directory of programs companies only encourage volunteer-involvement in a few select organizations chosen by management, thus limiting the choices of where and how volunteers get involved, and thus the number who do get involved. By building a platform that is used in many cities, we connect volunteers and youth from multiple programs in a single city with multiple programs, learning and networking opportunities across the world. We expand the range of ideas that volunteers, youth and supporters can bring to individual tutor/mentor programs, and that they can bring to their own work/life experiences. What makes our strategy unique is that we not only collect information, but we attempt to create greater advertising frequency so more people use the information and become volunteers, donors and supporters of tutor/mentor programs throughout a region. What also makes us unique is we focus on single cause and use maps to focus on a distribution of programs. I think on any site with multiple causes, it’s hard to attract attention to a single cause, and to the orgs in that cause. This strategy can duplicate in other cause areas. In this Forbes article the author writes: "Business depends on people making or doing things that other people believe are valuable enough to be worth paying for." For the Tutor/Mentor Institute, LLC to earn income as a business model we need to find ways to identify potential purchasers of our services, show value, and provide a way for services to be purchased. In this same article the author also writes "Corporate philanthropy is still important, and partnerships are more important than ever. Corporate philanthropy isn’t intended to have significant and measurable business and/or social results but it does need to be aligned with social purpose. " 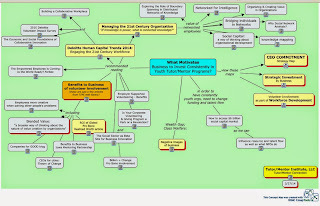 This concept map shows what I believe are values to business of investing in a tutor/mentor strategy. How does one generate revenue for sharing ideas. Read this article about thought-leadership, titled "5 Reasons Why Thought Leaders Should Never Charge for their Time." These are challenges I'm facing and have not found answers for. Getting business leaders engaged in this discussion is one of the primary barriers to success. Read this blog article and view the graphic above on-line. If you're reading this, can you help develop this argument and strategy? Few others do this in as many ways. Thus, this strategy could be duplicated in many cities, with support from Tutor/Mentor Institute, LLC.